UCC 128 labels, or now known as the GS1 128 label are Perforated Vertically and Horizontally. Can be easily separated into 4 pieces. 100 Sheets, 400 White Shipping Labels. 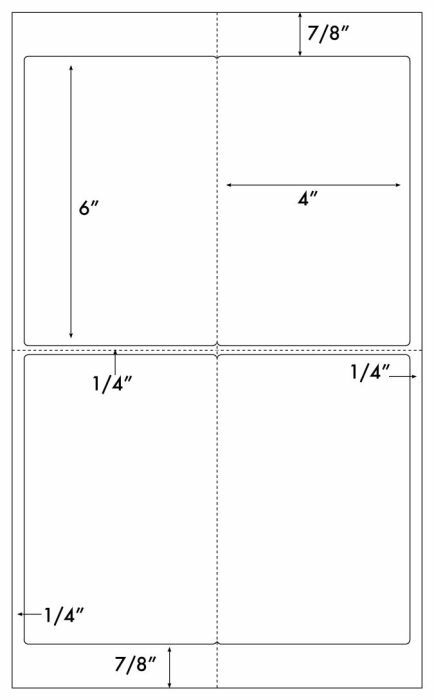 Sheet is Legal Size - 8.5 x 14 or 8-1/2 x 14. This 4" x 6" Label has many uses. Number 1 use is Shipping Labels. The large sheet lets you print 4 labels per sheet. Signs are another usage. The shape will make a sign look great. Just what I was looking for! Great product and I love that I don't have to cut these to size myself. Fast delivery and excellent customer service! These labels are exactly what our shipping department has been looking for. The labels are perfect for what they need and they got here in a timely matter. We couldn't be happier with the product this company has provided us with. I have to say this is the only company who has met our needs when it comes to the labels. Thank you so much for the service and we will continue to purchase from this company! These labels work perfectly for our application and get here fast when I reorder. I've been ordering from this company for years and plan to continue for many more. Saves time and money compared to the thermal label system we previously used! These labels are perfect for ASN UCC-128 labels. It was helpful to use our existing printers with these labels, thus saving the cost of buying a dedicated printer.